"What I find impressive and captivating about this book is the philosophy, the symbolism and the poetry with which Raffel writes. I think this book... is destined to become a movie. I will be first in line to see it." "Through Raffel's crisp, muscular prose the dialogue unfolds with frightening veracity. In drawing his characters and their voices, Raffel does not stumble." "A FINE AND DANGEROUS SEASON is impressive from beginning to end.... Raffel’s ability to deftly switch topical gears makes this a must-read." "A compelling story, written with a sure hand, that keeps you intrigued. But watch out for the gut punches. They come often and unexpectedly. Raffel definitely has his game on." "It's been half a century since the Cuban Missile Crisis brought us to the edge of the abyss. It's about time we got a page-turning thriller this good about it. The stakes are incredibly high, the action swift and chilling, the writing sleek and smooth. And the historical characters, from JFK to General Curtis LeMay, leap off the page. It may be fiction, but you'll believe every word of it." "A rare historical novel exciting and utterly believable with Jack Kennedy as you’ve never seen him. Raffel is a master storyteller. I loved A Fine and Dangerous Season." "A clever and deftly crafted retelling of the Cuban Missile Crisis through the eyes of JFK's old college buddy. Not to be missed." "Raffel takes the reader on a wild ride from Stanford University right before World War II to one of the most dangerous moments of the Cold War. Loved it!" "Think you know JFK? Think again. 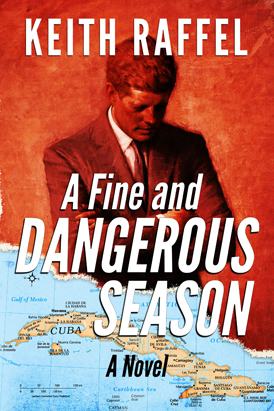 Keith Raffel's novel A Fine and Dangerous Season is a nail-biting, meticulously researched foray into the real-life thriller territory of the Cuban Missile Crisis. Don't miss it!"